Before I became a full-time writer, I was a teacher. I taught various subjects, at secondary and tertiary level, but the most rewarding aspect of my work was teaching adults to read and write. I’ve done this for most of my life; for years it was in a voluntary capacity but in the last few years it became part of my paid work. It’s wonderfully rewarding work and I urge anyone who has ever thought of helping someone to read, to seek some training and do it. Also, if you know anyone who cannot read and you think they might like to change this, encourage them to seek out a literacy class or teacher. Most of my adult students come to their first class feeling incredibly nervous, sometimes even a little belligerent, and frequently totally negative. It is wonderful to watch that change as slowly but surely people learn to read and a lifetime’s burden of being made to feel stupid, ignorant or helpless is lifted. Here you can see PageTurners – small adult literacy reading books which are written by myself and two friends, also teachers. They are published by PRACE, an Adult Community Education provider, for whom I used to work and still have strong connections with. 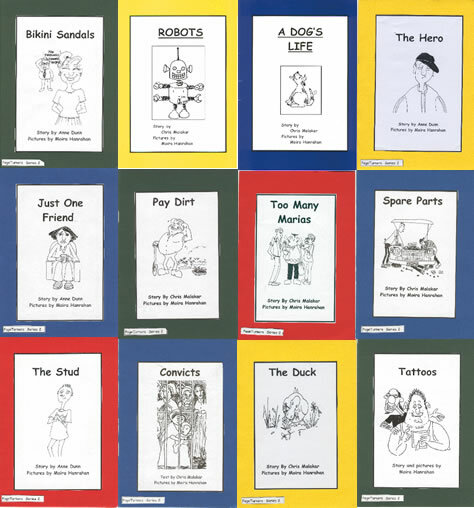 The books are simple-to-read stories, perfect for adults just learning to read and are on topics of interest to adult readers. They are often funny and are illustrated with delightful cartoons, drawn by Moira Hanrahan. They’ve proved very successful, and we’ve now published 67 titles. As well as being available across Australia, the books are sold in Canada, the USA, the UK and New Zealand. You can read and listen to one of the stories here: Snakes Alive. In the meantime, I urge you to do what you can to improve the level of literacy in your community, by donating time, effort or money to literacy work or simply by encouraging someone you know to take that first step.